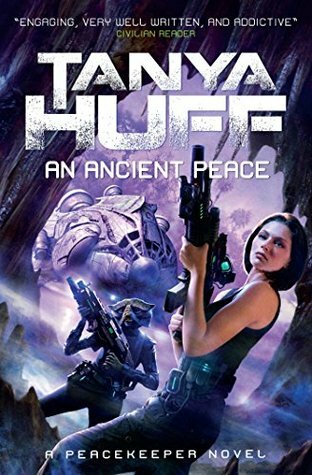 The first book of a thrilling new military science fiction spin-off of Tanya Huff's Confederation series. Gunnery Sergeant Torin Kerr had been the very model of a Confederation Marine. But when she learned the truth about the war the Confederation was fighting, she left the military for good. But Torin couldn’t walk away from preserving and protecting everything the Confederation represented. Instead, she drew together an elite corps of friends and allies to take on covert missions that the Justice Department and the Corps could not—or would not—officially touch. Ancient H’san grave goods are showing up on the black market—grave goods from just before the formation of the Confederation, when the H’san gave up war and buried their planet-destroying weapons. Someone is searching for these weapons and they’re very close to finding them. Fortunately, only the Corps Intelligence Service has this information. Unfortunately, they can do nothing about it. Though Torin Kerr and her team are no longer a part of the military, the six of them tackling the H’san defenses are the only chance the Confederation has. The only chance to avoid millions more dead. So yes this is the start of a new series, but be warned, it's also book 6 of her adventures. But new series and all. In that way, yes it could work as a standalone. But you would miss how she fought in their wars, had her adventures, found a conspiracy, and ended up with Craig. But, sure it works like it is. Torin is ex-marine. She is tough nails and she was so very military. But the previous series threw some punches and now she is out. But when you are out, they pull you back in! She has her crew, they get a job and they take it. The world may be at peace, but those others are still out there. Some humans are making noise about humans first. Other alien races not touched by the war is all murderers, idiots! When you have Elder races, telling younger races to fight their wars, while middle races sit it out, oh will this confederation really last? And now someone is trying to steal big bad weapons. Peace in space, not an easy thing to have. This is military scifi. There will be fights, tech, weapons and lots and lots of danger. Those H'San sure knew how to invent stuff. But it's not non stop action all the way. Torin still has time to worry about a teammate, who really needs someone of his own kind (long story, but they really really need others). She is a good woman. I do wonder where this new business will take them. Lots of space still to explore. I definitely like the sound of Torin! Does this feature new characters or just a new storyline? I love some good sci-fi. I think I'd want to start where her story first began, though. I havent' read a good space scifi in awhile, oh wait, I take that back, I read Illuminae. Hm... this one sounds good but also sounds like I would enjoy reading the other series first. I liked this one too, but need to read other books in series. You miss out on too much otherwise! Awesome review! This looks like fun. I've been burnt before on the #1 of one series and #whatever of another. Sometimes they don't mark the original series well enough, especially if you really need to read the original series to know what is going on. I'm glad this one works out. I'm really glad you're getting into sci-fi because I'm so curious to see what else you'll be reading! This one was a book I'm actually interested in. So pleased to see it intrigued you, because I really want to check it out now. I'll have to check out the original series. I like this type of stuff once in a while. It might be too military and sci-fi for me.. This one sounds right up to my alley. Maybe I'll start with the original series first, to know the background of the characters. Still this book does not seem like a good place to start, I like to read my stories from the beginning.